New advances in dental technology give dentists the added tools to provide a higher level of quality care. This not only benefits the dentists that are striving for excellence but also benefits the patient by receiving better dental care, which translates to dental work that lasts longer and is, therefore, a much better value. It’s better to have any work done correctly once – than three times poorly. New technology offers the dentist new and powerful tools to diagnose and treat various dental problems sooner and with virtually no discomfort to the patient. Similar advances in medicine have occurred with MRI (Magnetic Resonance Imaging) and CT Scan (Computer Tomography) that pushed technology far beyond various conventional x-rays. Although conventional x-rays are much less expensive, it is obvious that the educated consumer would choose the newer technology MRI or CT Scan to diagnosis a serious ailment such as a brain tumor. Choosing newer technology to diagnose and treat oral health problems or for cosmetic procedures should be no different. The advantages of technology become clear when the patient understands the significant advances in the dental field, such as laser caries detector, digital computerizes x-rays, computer-assisted anesthetic machines, computer-driven education systems, soft-tissue lasers, and the advances in dental materials. We've found another way to make our patients smile! For the past decade, we've been using a new computer-controlled anesthetic delivery system, The WAND. The WAND lets us administer medication injections with little or no discomfort to our patients since the flow and volume of anesthetic are delivered slowly, below the pain threshold. The system even places a drop of anesthetic at the site of injection, prior to needle insertion, preparing an anesthetic pathway. An intraoral camera is an indispensable diagnostic and educational tool. The tiny device is a video camera that moves around inside the mouth and generates a tooth by tooth video exam of the teeth. This allows the patient to see and own the condition of their own mouth. This allows them to participate in diagnosis and treatment planning. Digital radiography 's technology improves and simplifies the way we care for our patients' teeth, resulting in better dental evaluations and treatment decisions. The instantaneous, clear computer screen image allows us to immediately discuss the findings with our patients. This is truly an emerging field that will have a tremendous impact on how dentistry is performed in the future. 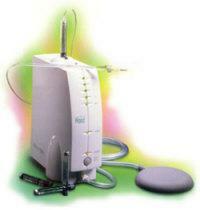 Shown here is our laser that is used for cosmetic gum recontouring lesion removal, treatment of gum disease and removal of excess gum tissue. The new DIAGNOdent Laser is here and we are the first on our block to have one! It takes the place of that instrument (explorer) we stick in your tooth to check for cavities. 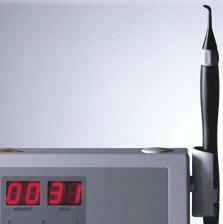 It is actually a laser that digitally reads decay in graduating degrees within your tooth. No more guesswork! This "steri-center" is a state-of-the-art sterilization area where nothing is left to chance. Those little bugs don't have a prayer in our office! The use of magnification glasses, or surgical loupes, allows the doctor to see three times larger than normal. The advantage of magnification allows the dentist to provide a much higher level of dental care and allows the dentist to see what might have otherwise been missed with normal vision. Concerned about water purity? Have you been watching one too many installments of "20-20 takes 20 shots at dental offices"? Well... rest easy. This point-of-source water bottle is just ONE method we use to ensure that the water we use is cleaner than the water you drink... bottled or not! We use this orthopantomograph to take full-mouth x-rays every few years. Different from the small "tooth" x-rays we take periodically, this will locate cysts, jaw fractures, cancerous lesions and other abnormalities of the bone and tissues in and around the oral cavity. Panoramic radiography, also called panoramic x-ray, is a two-dimensional (2-D) dental x-ray examination that captures the entire mouth in a single image, including the teeth, upper and lower jaws, surrounding structures and tissues. Dental cone beam computed tomography (CT) is a special type of x-ray equipment used when regular dental or facial x-rays are not sufficient. Your doctor may use this technology to produce three-dimensional (3-D) images of your teeth, soft tissues, nerve pathways and bone in a single scan.